Opening shot of documentary Taking Over, Taking Back (WNV/Taking Over, Taking Back). As the mainstream media covers the five-year anniversary of Lehman’s collapse like rubbernecking motorists, two videographers decided to eschew the gory details and document another angle of the crisis: the surprisingly powerful organizing that has sprung up in neighborhoods hardest hit by the devastation. 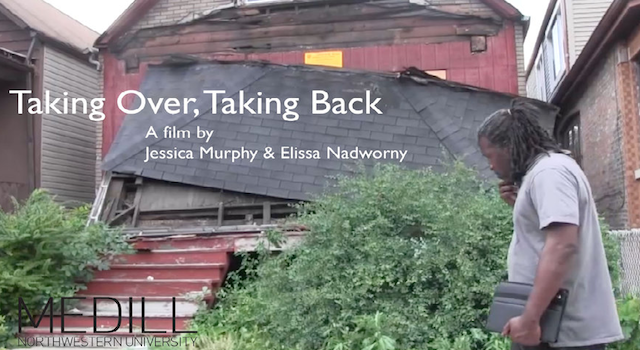 The short documentary Taking Over, Taking Back, created by Northwestern University filmmakers Jessica Murphy and Elissa Nadworny, highlights the work of one such community group: the Chicago Anti-Eviction Campaign. Founded in Cabrini Green, once one of the nation’s largest public housing projects that was rapidly depopulated and then demolished in the early 2000s, the Chicago Anti-Eviction Campaign is now comprised of homeowners, renters and houseless people who organize to take over vacant, bank-owned houses and help fill them with their rightful owners: people. For the Chicago Anti-Eviction Campaign, the film represents a publicity hat trick, coming on on the heels of an in-depth New York Times Magazine feature by Ben Austen in May, and a book published in August by yours truly. But it’s one thing to read about home takeovers, and another thing entirely more powerful to see them dramatized in video, particularly when they are set against the backdrop of Wall Street-wrought destruction. The film balances this contract perfectly, beginning with shots of boarded-up houses marked with red X’s to signal they are structurally unsound and ending with celebratory groups of people rehabbing and reoccupying these very same type of structures. As the film explains, waves of racially tilted foreclosures have turned the South and West Sides of Chicago into a graveyard of vacant bank-owned properties; of the 90,000 completed foreclosures in the county, 62,000 of these structures remain empty and approximately 100,000 people are now without a stable place to live. Enter the Chicago Anti-Eviction Campaign — which, as founder Willie “J.R.” Fleming often explains — seeks to play matchmaker between peopleless homes and houseless people. 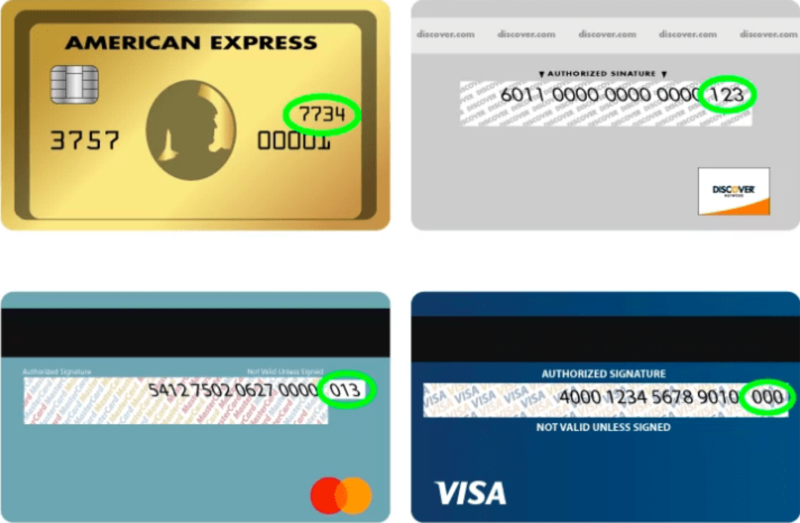 It’s an enticingly simple formula that appeals to a broad segment of residents in Chicago. The film features Emma Harris, a 91-year-old homeowner fighting foreclosure, Isaac Alexander, a young father at risk of homelessness, and Patricia Hill, a retired firefighter who reoccupies her home after bank-pursued eviction. 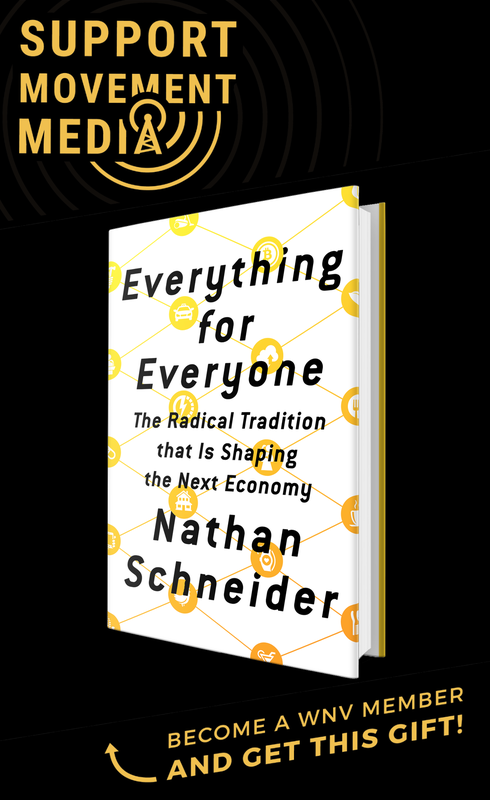 But even more important than a digestible ideology is the way the campaign has turned economic necessity into a catalyst for radical political action — led by the very people most affected by the crisis. In this way, the film offers an instructive vision for other social justice groups, regardless of the issue they are organizing around. Take, for example, Martha Biggs, a campaign member who appears throughout the film directing megaphone chants and drilling boards and locks off soon-to-be liberated houses. Now one of the leaders of the movement nationally, Biggs was a once-houseless mother who liberated a bank-owned home in 2010 with the help the Chicago Anti-Eviction Campaign. She is a clear example of how grassroots movements for economic justice must strive to meet people’s basic needs, not to turn the group into social service provider, but out of recognition that people must survive so they can fight. And if the work to meet people’s needs can, in and of itself, be direct actions against Wall Street — as in the case of home liberations — well, that’s just revolutionary. I know you were busy with the book coming out, it is nice to have you back covering important subjects. I love to read your take on the impending government shutdown.